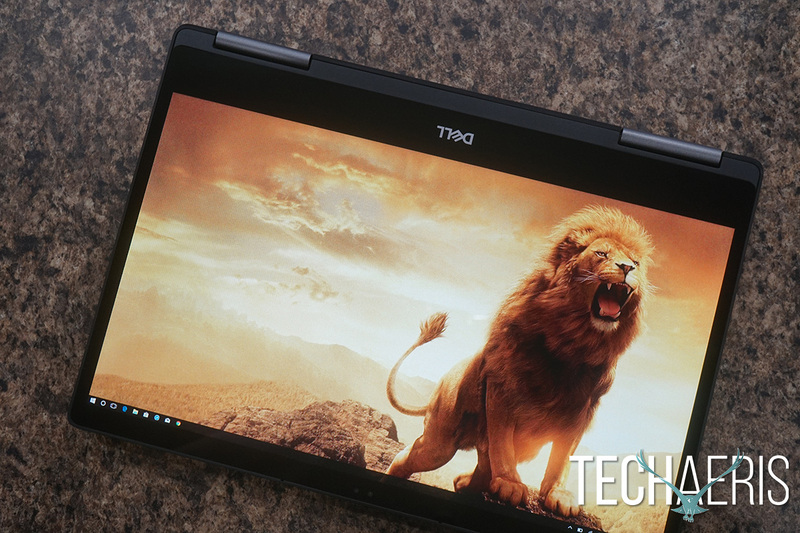 The Dell Inspiron 13 7373 is an amazing 13″ laptop that most regular consumers will be happy with. It has been awhile since I’ve used a Dell laptop for an extended period of time. 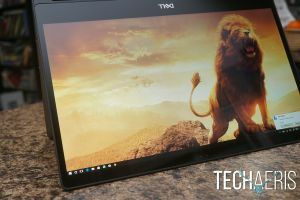 The company sent along their Dell Inspiron 13 7373 for us to take a look at and review. 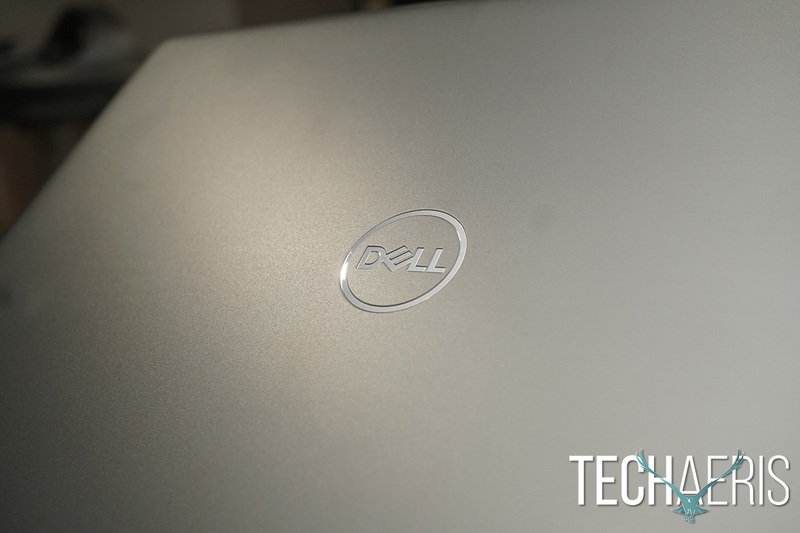 The Dell Inspiron 13 7373 is a portable 13″ laptop that has a starting price of $799USD. You can configure the 7373 in a variety of ways and push that price up past $1200USD. 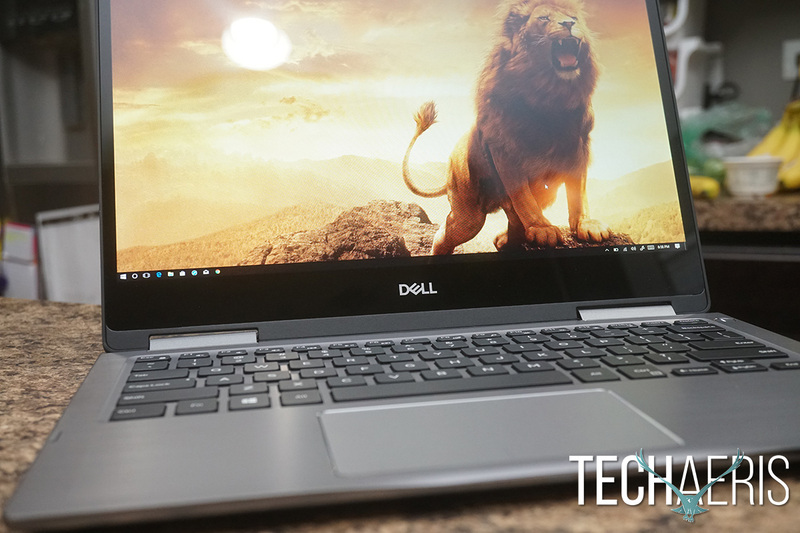 Let’s dive in and talk about the Dell Inspiron 13 7373 and see what we thought of it. 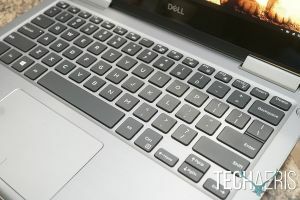 Having not used Dell laptops in awhile, I was surprised their design remains familiar. 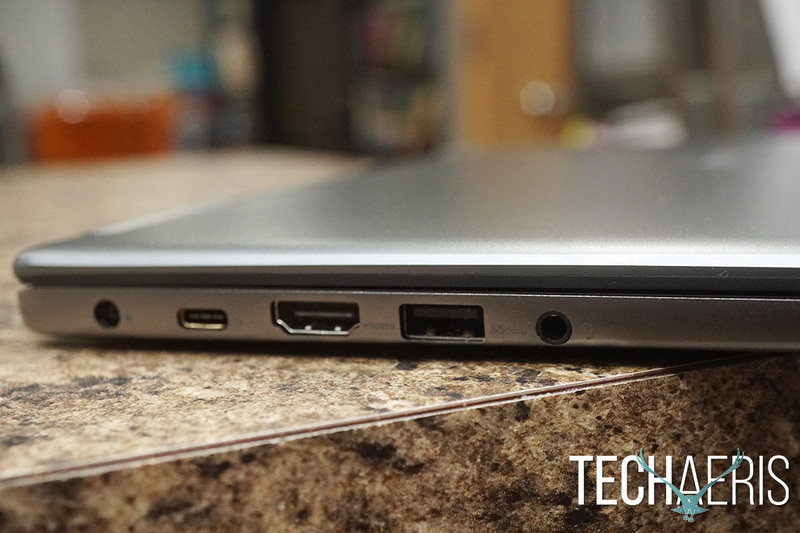 There have been some changes but as the Dell Inspiron 13 7373 sits closed, it looks like… well, a Dell laptop. That’s not a bad thing. Dell has had a variety of designs but I think the looks of the Inspiron line has generally remained true to itself. Right off the bat, I noticed the laptop’s weight. It certainly feels substantial. 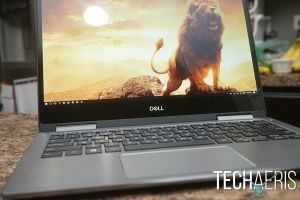 I think this has a lot to do with the premium materials Dell used on this laptop. 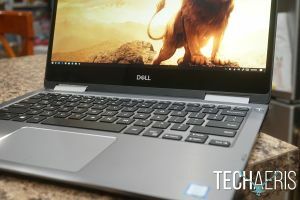 It could have been easy to cheap out on a $799USD laptop but Dell didn’t. 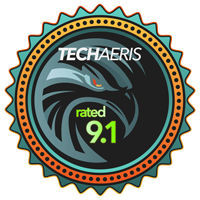 This entire laptop feels solid and very well built with no signs of cheap anywhere. The bottom of the Dell Inspiron 13 7373 has some excellent ventilation ports to push heat from the CPU. I also love that Dell opted for these long rubber pads on front and back instead of feet. They make a nice design aesthetic but I think also help keep the laptop up off flat surfaces and balanced. The speakers are also on the bottom, more on those later. On the top of the 7373, you’ll find the typical Dell branding and nothing more. The laptop’s hinges are 360-degree and look sturdy and well-built. These allow the laptop to be used in 4 different modes. This isn’t a new feature but it’s great to have the versatility. Along the right side of the Dell Inspiron 13 7373, you’ll find your Noble Security Lock, a single USB 3.1 port, and the 3:1 SD card reader. Move over to the left side and you’ll find the remainder of the ports. These include power, USB 3.1 Type-C, HDMI 2.0, another USB 3.1 port, and your headphone/microphone jack. Opening up the machine you’ll find the full size backlit keyboard. 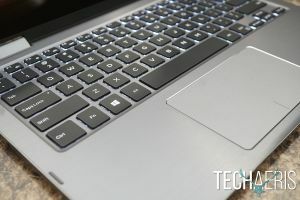 I’m more and more impressed with PC laptop keyboards these days, they are getting better every year. This one is no exception. It’s a pleasure to type on. The travel is between a traditional keyboard and the MacBook Pro keyboard. 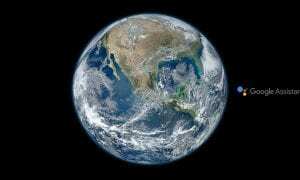 So it’s not too shallow but not too far, it’s nearly perfect. 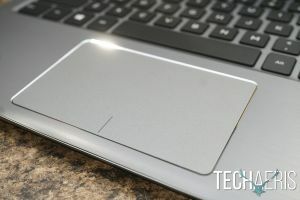 The trackpad is also really a pleasure to work with. I’ve always been a fan of Apple’s trackpads and I still am, but I think PC makers are finally getting better at this trackpad thing. It’s still not as smooth as a MacBook Pro trackpad, but it’s certainly a really good trackpad. Overall, this machine is really well built. It’s like a little tank and the weight really is noticeable. It’s not bad for portability but it is certainly heavier than other 13″ laptops I’ve used. The Dell Inspiron 13 7373 comes with a brilliant FHD (1920×1080) display measuring in at 13.3″ on the diagonal. Honestly, I really think most people should be just fine with this FHD display, especially on a 13″ laptop. I’ve used 4K 13″ and 14″ laptops and while these are amazing for 4K video content, for daily work I always set them back to 2K resolution and sometimes FHD resolution. Working on a 4K display gives you a crisp and clear view but that means those pixels make everything smaller. I know I’m getting older (LOL) and my eyes aren’t the best, but doing daily work is much easier in FHD or 2K. Basically, don’t be scared that this panel is only FHD, it’s perfectly fine. 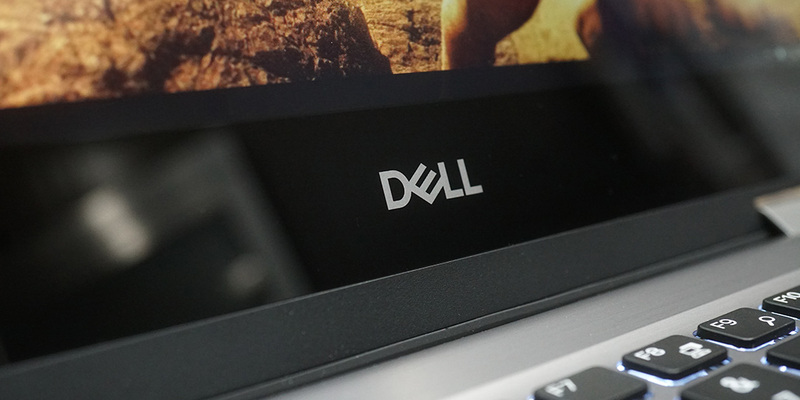 The bezels along the right, left, and top are fairly thin, but not as thin as the higher end XPS line. The bottom bezel is fairly thick and has the second Dell logo, just in case you forgot what you bought. One thing I like here is the webcam is located along the top bezel, a better placement than the XPS line. The screen is touch-enabled allowing you to take full advantage of Windows 10 touch gestures. Touch-responsiveness is spot-on and the screen registered my touches even on the smallest of areas. The 360-degree design allows the laptop to be used in tablet, tent, and presentation modes. All of these modes lock out the keyboard and allow you to basically use this as a tablet. The colors are rich and deep with this panel. The blacks are pretty spot on and the whites are nice and bright. The screen gets fairly bright (300 nits) and looks good outdoors and decent in direct sunlight. Viewing angles indoors are great, outdoors you may get a bit of glare. But looking straight on there is no problem. Overall, this is a really amazing display on a $799USD 13″ laptop, Dell really packed in a lot of value here. The Dell Inspiron 13 7373 is running Windows 10 and frankly, not much to say here. Our review machine was 64-bit and I really don’t think there are many machines in this price range that aren’t running 64-bit. The one thing I will complain about is the included software that some may not want to be included. Minecraft, Keeper, Netflix, Dropbox, assorted games and of course, McAfee. It would be great to see PC makers start omitting these wares and allow users to make their own choices. Overall Windows 10 runs great on the system. The touchscreen allows for the full Windows 10 experience which is versatile when using the different modes. The added software that most people don’t want is, unfortunately, the reality, for now. Our review unit came with the Intel Core i5 and 8GB of RAM. You can configure the Dell Inspiron 13 7373 multiple ways and this configuration is the basic build. I found this machine handled web browsing, email, messaging, light gaming, multi-tasking, and all the normal day-to-day things with ease. With the lack of a dedicated GPU and strong CPU, this is probably not going to serve you well as a gaming or creative machine. Although you can use some art apps that work well. The Dell Active Pen also works with this laptop so that’s helpful. Overall, this isn’t a pro machine by any stretch. But regular non-pro users will be pleased with its speed and efficiency at day-to-day tasks. It’s a super machine and should serve most people well. So speakers and sound. Yeah. Normally I hate laptop speakers. Normally they’re on the bottom of the laptop. The Dell Inspiron 13 7373 speakers are indeed on the bottom. Here’s the kicker though. These actually sound really nice! Overall, as laptop speakers go, I was very impressed here. Like speakers, webcams on laptops are what they are. This camera is about the same as any other laptop webcam. It gets video conferencing done without making you look like a jumbled mess on the other end. It’s not something you’re going to be taking photos and video with but it works for its purpose. That’s about all you can ask for a webcam. Dell says the Dell Inspiron 13 7373 should get about 8-hours 20-minutes of battery life. Battery life is really going to depend on how you use the machine so it’s pretty subjective. In my normal use, with brightness to full all the time and backlit keyboard on. I was able to get around 7-hours on average, which isn’t bad for my use case. This will vary from person to person. 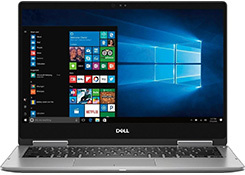 The Dell Inspiron 13 7373 starts at $799USD and can be configured to a price exceeding $1200USD. Honestly, the entry-level $799USD machine really is a beast and a tremendous value as is. I don’t see why average consumers would need more. 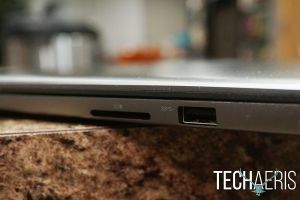 * We were sent a review unit of the Dell Inspiron 13 7373 laptop for the purposes of this review.